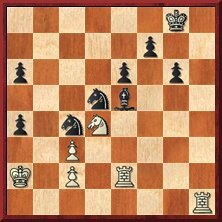 In the very strong Grand Slam Final Radjabov had a comparatively weak start, failing to win from a promising position against Ivanchuk, and losing in spite of having a clear advantage with black against Carlsen. He also went wrong in mutual time trouble in his second game against Ivanchuk. 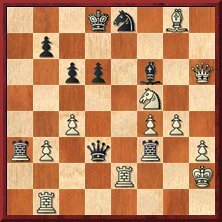 In the final round Radjabov turned around what seemed to be a totally lost position against Aronian, in the most amazing comeback of the event. On the whole a -1 result in 10 games is no catastrophe in these surroundings and Radjabov had a rating just over 2750, ranked 8th in the world, after the tournament. Some annotators meant that 45. 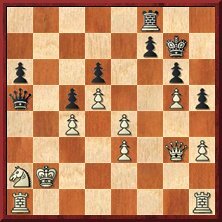 Rbe1 was an easy win for white, missing among other things the line 45. Rbe1 Rxb3 46. Rxe8+ Kc7 47. Qh7+ Kb6 48. c5+ dxc5 49. Bxb3 and black is winning because of Rf2+ followed by Qf3. Aronian failed to find the line that could have secured him a draw and played the quickly losing 45. Reb2 with less than 20 minutes left for the rest of the game. The tournament used a scoring system where wins gave 3 points and draws 1, and Topalov won ahead of Carlsen and Aronian. Table with the traditional scoring system given below. Radjabov had a good tournament in Sochi’s Grand Prix series event, where he was unshared second, 0.5 from first place. He was well ahead of players like Ivanchuk, Svidler and Karjakin, and behind only Aronian after the latter’s win against Grischuk in the final round. Radjabov played Carlsen’s a6 Dragon against Karjakin and scored a beautiful win after a double exchange sacrifice. 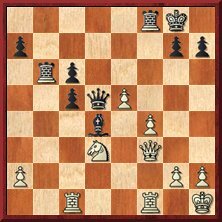 In spite of mutual time trouble Ivanchuk saw the danger and went for white’s strongest option, that secured a repetition draw (36. Nc3 Qb4 37. Na2 Qa5 and so on). 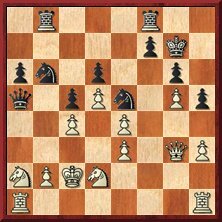 In 2007 Radjabov made the Schliemann Defense his standard response against the Ruy Lopez. He drew a couple of rapid games against Kramnik and Carlsen, while he won against Shirov. Just in 2008 he has played it six times in top tournaments without being defeated, against Anand, Topalov, Carlsen, Svidler, Mamedyarov and Polgar.